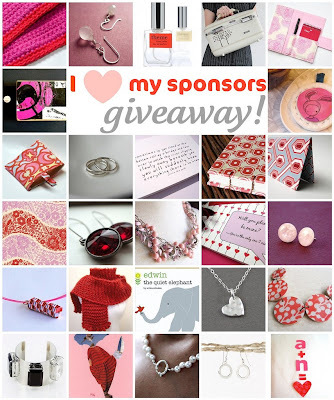 the rikrak studio: i LOVE my sponsors GIVEAWAY! i just have the loveliest readers out there! thanks for your encouraging words & dear dear comments. i always love reading what you have to say! and thanks for playing all the little games and activities on the blog, too! AND... thanks so much to all of you lovelies out there who have really made my day by supporting my little adventures, as dear sponsors! you nicies mean the world to me, and i really appreciate it! so with a thankful heart, and with lovelove time coming up next week, a little giveaway for all of you! d) the winner of this giveaway will be chosen from random.org on february 15th @ 9pm EST. and tune in MONDAY -----> for the handmade olympics shortlists AND voting! yay! love-ly weekend to you, nicies! Another great giveaway! Thank YOU!! Hi! My favorite item from Phul Effect's shop are the Pineapple Express earrings. My favorite item from dothandmade's shop are the small vintage brass filigree and gold-filled earrings. I just found your blog and am now following. Love this blog! My favorite item from the Fabric Shoppe is the Flora and Fauna Fabric by Patty Young for Michael Miller Daisy Dot in Stone-Fat Quarter. When my husband and I first met, we were both living overseas for work. We first met in a local English pub, but he didn't talk to me at all that night. A week later I ran into him outside the ladies room on the floor of my office - he was escorting the cleaners since it was a restricted area. And that is where he first sort of asked me out, least invited me to their happy hour party. He is a US Marine, and I was working for the government. We dated the whole 3 months I was in country, and continued a long distance relationship for 2 years. When I was living in West Africa for another assignment for a year, he bought and had shipped 2 dogs from the States so I wouldn't be lonely. We have been married for 4 years now, still have those 2 dogs, and now a 2 year old daughter. Being married to the military, we move often. We are now stationed in California. My best friends are in New Jersey. At least once a month, I call or facebook or text them to tell them that I love and miss them. I always want them to know how much they mean to me and what important parts of my life they are. I like the Lavender Sachet, Hand Embroidered Snap Dragon from Quiltish. BlommaFinds blog is great! I recently started a finds blog and hope to one day have one of her caliber. I bookmarked it for future reference. I am about to move and have big plans of decorating this place, so her blog will come in handy big time! I like the Crossword Puzzle Bib Necklace from Pulp and Paisley. My favorite love story is the one of my boyfriend and I. We met when I was only eleven, on the school bus. We became best friends when I was 14, and we were close, but never dated. After failed relationships on both sides, we began dating when I was 21 and we have been together for 9 years now! At the fabric shoppe, I love the Lil' Plain Jane in Agua Fat Quarters. What I could do with that! I read blomma finds daily - love the whole blog! Currently, I have post on Maxine Sutton bookmarked and plan to purchase some things from her collection when we move into our new house. I love the fabric shoppe, I love that she bundles up fabrics for easy selecting. Love the Polka Dot Brass Ring Earrings from pulp and paisley's shop. Very cute!! Lagoon Fabric by Michael Miller, Yard Bundle- 5 total from fabricshoppe. Covet Necklace from phuleffect is lovely!!!! she wore pearls - a necklace of vintage and recycled jewelry from alexkeller is wonderful!!!!! I choose vintage-Looking Chair and Damask Boxed Set from DawnCorrespondence. Secrets Necklace is so cute!!!! (from pennyglassgirl). I like the Breath of Fresh Air Notecard from Dawn Correspondence. I like the Humingbird Copper Enamel Pendant from Penny Glass Girl. I like the grey and purple on matte black paper flower earrings from papermode. From fabric shoppe: I love the Woodland Delight Fabric by Paula Prass, Fat Quarter Bundle- 5 total. From elliven: Ipod Sleeve - Amy Butler. From fabric shoppe, I love the I Want to Be a Cowboy fabric bundle! From the Fabric Shoppe, I'd love to have http://www.etsy.com/view_listing.php?listing_id=39697114. I love the gold cuff bracelets at Hazel and Harlowe. I love the charity "kitten series" cards in Emmart's shop. That's a great idea. Love the hammered sterling silver pieces at Adorn and Cherish. fabric shoppe - I love the organic bundle. The colors are so pretty! phul effect - Love, love the shiraz earrings. Simple and elegant. alex keller - The grey garden necklace is stunning! Definitely my favorite. dawn correspondence - Oo, I love this shop! I just bought her "Will you be mine?" Valentine card. My other favorite is the "Hey there, sailor." cards. paper mode - I love the paper jewel rings. So cute! the empty nest - I have two favorites - I can't choose. The chocolate cowl with the removable brooch and the green with envy wrist warmers. I Love the Fabric Shoppe Mind's Eye for Riley Blake. Love it! Just called and told my sister I love her!! I like Paper Cakes blog. She always features the most amazing products. I follow her! I'm a follower and have you on my blog's blogroll! Wow, this is hard - Phul Effect I think I'll go with the Cleopatra earrings, but it's really difficult to pick one thing! I might just fight to keep it for myself! The Fabric Shoppe's Jennifer Paganelli fabric, Zebra in Brown is so cool! The .Seven Seas Earrings. from Phuleffect are really beautiful. The Alex Keller trio - violet (a necklace of vintage and recycled jewelry) is beautiful. I like the envelope seal at Dawn Correspondance. I REALLY like the papermode Square paper earrings! The mounted fish tank blogged by blomma finds is WAY neat! I like the Etsy orange earings at Pulp & Paisley. blomma finds - I love that this blog has an indie section. So cool! I also love the fish bowl featured a few days ago. ZionShore - I love the Cold as Ice necklace. Pretty with a twist. pulp&paisley - Everything's so bright and cheery! My favorite is the Nature's Sundries bracelet. hazel + harlow - I can't decide between the blue moon pendant and the antiqued sleepy owl pendant. I love them both! emmarts - My favorite is the "A November Day in Princess Park" photograph. Gorgeous! mich made - I love the onyx necklace with cherry quartz crystal accent. So pretty. fluur - I love the Burton scarf. It looks so cozy! lacokine - My favorite is Zen necklace 1. Love the image on the charm. theme fragrance - I think the sarong scent sounds heavenly. And I love the roll-on perfume idea. getreadysetGO! - My favorite is the vintage purple plum suitcase. I love the color! I love the Catalina de la Torre Modern Cut Flower Necklace from Hazel & Harlow! The Under Tulips photo from emmarts is gorgeous! Love the Gold Filled Flower Bracelet from Mich Made! Ooo! The White Gold & Diamond stacking ring from adornandcherish would look fabulous next to my wedding band! Love the Laurent scarf from Fluur! The black heart bracelet from lacokine is so cute! My fav. love story is pretty much anything by Nicholas Sparks...but I guess my absolute fav is The Notebook! Love the Mini Card Wallet - Michael Miller from elliven. Love the Make a List notebooks from remaker! Love the cityscape blues. handfelted wall hanging or table top piece from tanisalexis! Love the Reusable Cloth Sandwich Bag -- Blue Peapod by RosyUndPosy. Love the Set of Three - Nature Bangle from dothomemade. Love the panda love card from letterhappy! love the LARGE JOURNAL Hip to be square from nightowlcraftworks!